Fighting ended early Monday with at least 20 dead after gunmen disguised as police guards and armed with machine guns and a rocket launcher stormed an airport terminal used for VIPs and cargo in Pakistan’s largest city Sunday night, according to officials. More than 20 people died in the Karachi airport attack, including nine airport security personnel, 10 attackers and two airport employees, according Major General Asim Bajwa, a Pakistan military spokesman. He said at least 20 people were wounded. Dr. Seemi Jamali from Jinnah Hospital in Karachi said 13 bodies had been brought to the hospital from the fighting. She said nine were airport security force personnel, one was a member of the paramilitary Rangers, one was from the police, one was an employee of the Civil Aviation Authority and another was from the state-run Pakistan International Airlines. Meanwhile, suicide bombers in southwestern Pakistan killed 23 Shia pilgrims returning from Iran in a separate incident underscoring how the fragility of Pakistan’s security. On Monday, Pakistan’s Taliban claimed responsibility for the airport attack, saying it was revenge for air strikes in areas along the Afghan border where the insurgents are based, according to Reuters. “We carried out this attack on the Karachi airport and it is a message to the Pakistant government we are still alive to react over the killings of innocent people in bomb attacks on their villages,” said Shahidullah Shahid, a Taliban spokesman. No one immediately claimed responsibility for the suicide bombing in Baluchistan province. The airport attack began late Sunday and continued into the dawn hours of Monday in Karachi, a sprawling port city on Pakistan’s southern coast. Officials said all passengers had been evacuated. Ten attackers carried out the operation, according to the Chief Minister of Sindh province, Qaim Ali Shah. “They were well trained. Their plan was very well thought out,” he told reporters. He said the attackers had intended to destroy some of the aircraft and buildings but were not able to. Bajwa said on Twitter that no aircraft were damaged and that as a precautionary measure, security forces were sweeping the airport before operations would be returned to the Civil Aviation Authority and airport police. Officials said weapons involved in the raid included sub-machine guns, rocket-propelled grenades, grenades and explosives. At least some of the gunmen wore the uniforms of the Airport Security Force that protects the nation’s airports, said an official who briefed journalists near the airport. He said all were strapped with explosives. He said one of them tried to capture a vehicle used by the Civil Aviation Authority and when a guard shot at him, the explosives strapped to his body went off. The official said another attacker also blew up after being shot at by security forces. The official described himself as being with one of the country’s intelligence agencies but declined to give his name. Authorities seized four machine guns and a rocket launcher, Thebo said. He said the smoke and flames were from oil that had caught fire. Pakistan’s paramilitary force said that the attackers were ethnic Uzbeks, reported Reuters. Pakistani officials often blame foreign militants holed up in lawless areas on the Afghan border for staging attacks alongside the Pakistani Taliban. Authorities diverted incoming flights and suspended all flight operations. 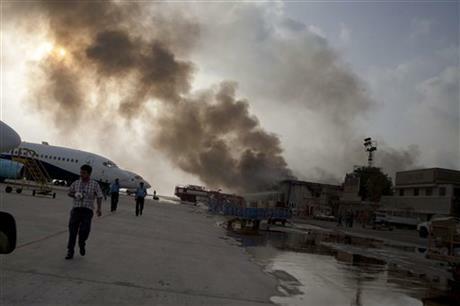 A spokesman for the Civil Aviation Authority said the airport would be closed until at least Monday night. Sarmad Hussain, an official with the state-run Pakistan International Airlines, was working at the airport when the attacks occurred. “I was working at my office when I heard big blasts — several blasts — and then there were heavy gunshots,” he said to The Associated Press after escaping the building. He said he and a colleague jumped out one of the windows to get away, and his colleague broke his leg. When Hussain came out of the building, he saw smoke billowing from the terminal. Karachi is Pakistan’s largest city and has been the site of attacks in the past. It is the country’s economic heart and any activity targeting the airport likely would strike a blow at foreign investment in the country. There was no immediate claim of responsibility for Sunday night’s airport attack. Pakistan’s government has been trying to negotiate a peace deal with armed groups mostly based in the northwest who have been waging war against the government. But the talks have had little success, raising fears that the groups will increase attacks across the country. Security officials in Karachi had feared that if the talks broke down, Karachi would be a likely spot for armed groups to strike back as the Pakistani Taliban and their allies increasingly have gained a foothold in the city in recent years. In the suicide bombing, four bombers targeted Shia pilgrims staying at a hotel in the town of Tuftan near the Iranian border, said Baluchistan Home Minister Mir Sarfraz Bugti. One bomber was killed by security officials traveling with the pilgrims, but the other three managed to get inside the hotel where they blew themselves up in an attack that also wounded 10 people, he said. It wasn’t immediately clear whether there was a connection between the airport assault and the Baluchistan attack.